The X01 is more than an upgrade - it's a new category of weapon platform. Fire Control Unit is a group of engineers, veterans, artists, and industry professionals that saw the potential behind FCU-powered firearms. 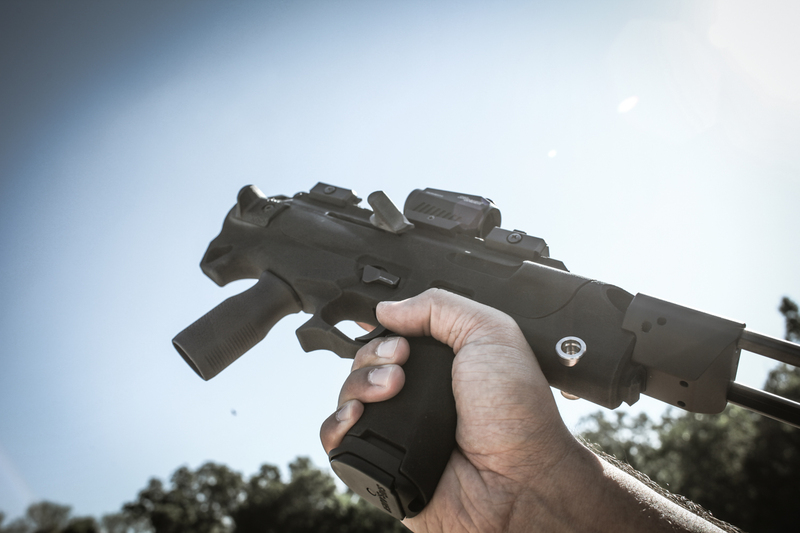 The X01 began as a basic concept and series of 3D prints in 2015, and slowly began to take form with the input of pro shooters, special operations community members, and elite law enforcement officers. The X01 is the first in a series of patent-pending soon-to-be-released drop-in upgrades for the Sig Sauer® P320® series of firearms. Be sure to stay tuned, as the FCU revolution has only now begun. The notable legal qualities of the serialized FCU allow the end user to purchase a P320® pistol with accessories that can be configured in multiple ways without purchasing a second firearm. 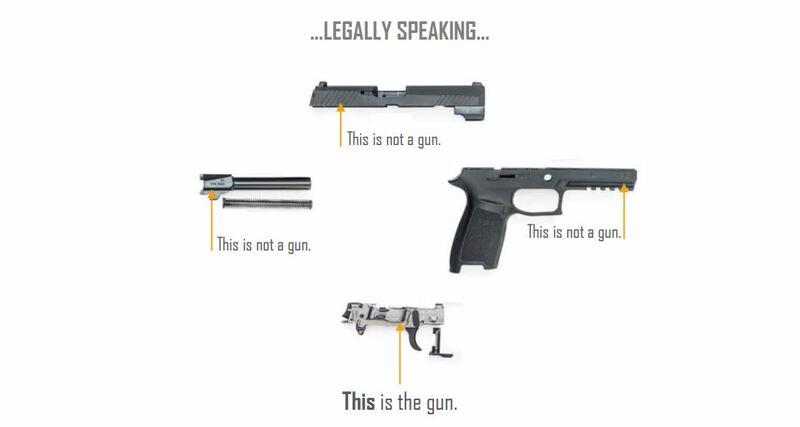 This relieves the burden of wait times, shipping methods, and various regulations for those who have already legally acquired a single firearm and desire a more diverse arsenal. For the firearm industry, this means that the sky is the limit for possible configurations, loadouts, and combinations of firearms, all without developing, selling, or shipping a gun. The X01 standard model can be chambered in 9x19mm Parabellum, .357 SIG, and .40 S&W by transplanting the corresponding P320® components (.45 ACP is in development, as the changes in magazine well dimensions require a specialized lower grip module). The X01 body is injection-molded in the US with glass filled nylon. The rear of the lower receiver features a vertical M1913 Picatinny rail for integration with SIG® MPX//MCX buttstocks and arm braces, such as models manufactured by SIG® and SB Tactical®. This rail can also adopt a sling attachment for outward tension stabilization, a non-shouldering cheek rest, or be left empty for concealed carry. 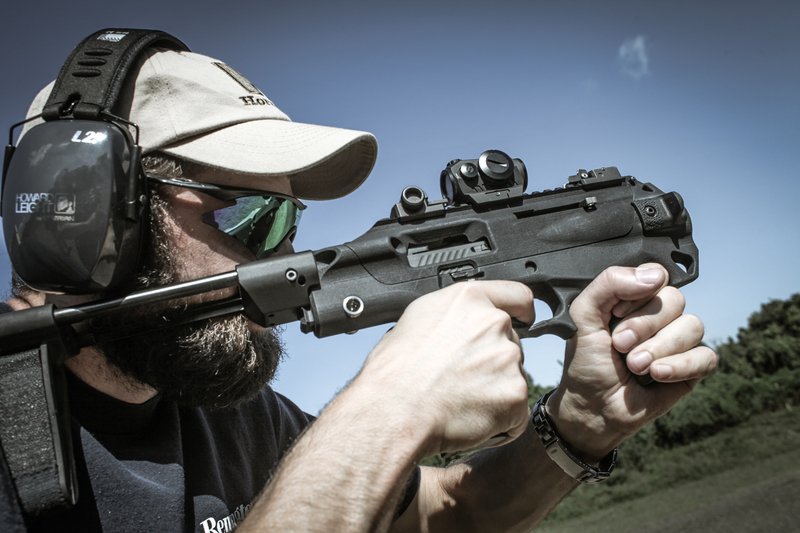 The X01 features an upper/lower module construction that attaches via the forward module hinge and is locked in place by a rear recoil spring guide. Models equipped with a dual-rod buttstock or arm brace will also lock together via two guide rod channels that span both the upper and lower modules for added stability. The upper module features shell deflection ramps to mitigate malfunctions. Steps to clear a malfunction are identical to the P320® with the exception of working the action via the charging handle rather than the slide itself. The upper module was designed to accommodate suppressor iron sights. The non-reciprocating ambidextrous charging handle locks the action open (the slide to the rear) with an upward motion when fully retracted. The action can then be released with a downward motion (akin to HK®-style weapon systems). In addition, if the charging handle is in the forward position, the slide can be released via the FCU slide release during reload procedures. 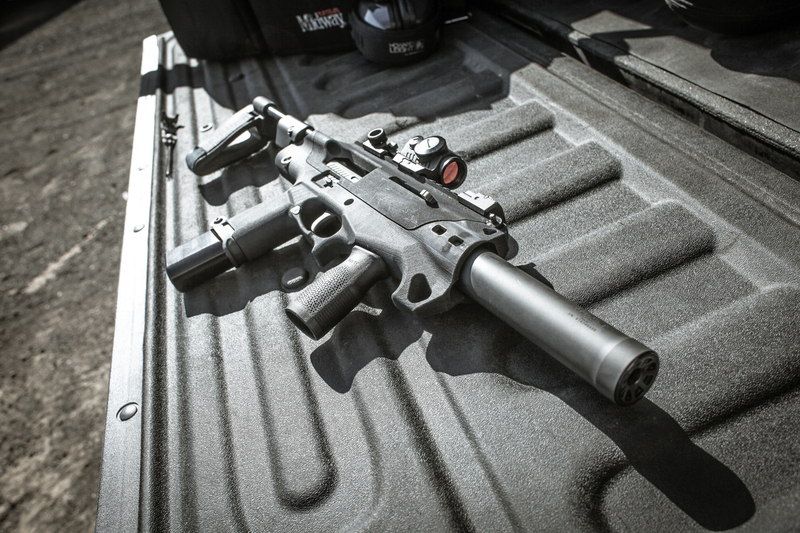 The X01 features three M-Lok slots near the muzzle for accessory and grip attachments. The upper module features a 19-slot milspec M1913 picatinny rail. Pistol/rifle backup iron sights (BUIS) are suggested for co-witness capability with low profile optics. The lower module features dual quick-detach (QD) points. The X01 was designed with ergonomics in mind and features an integrated angled foregrip with a substantial hand stop hook to prevent the support hand from slipping in front of the muzzle during dynamic weapon manipulation, as well as two specially-designed hand stops that mount via the M-LOK® slots toward the muzzle. Additional hand stops and grip accessories can be attached via the M-LOK® slots for a custom ergonomic interface. All components of the X01 are manufactured in the United States.